People nowadays are always in search of somewhere new to explore. And this time, I want to explore Taal Batangas, a heritage town that is only a few hours away from Manila. I first saw the Taal Basilica on television and I told myself I want see that church for real and other historical places found in Taal. So I invited some friends and off we went to one of most visited tourist spots in Batangas. We left Cavite at exactly 7:00 am and arrived at 10:30 am via Tagaytay. That was still allowing time for a leisurely breakfast in Tagaytay. The drive to Taal was quite scenic and the road was good – an easy journey. The old colonial houses scattered along roads of the historical town of Taal, Batangas, was a definite reminder of the Philippines while a colony of Spain. What I appreciated was the fact that they were able to preserve the rich historical background of the town for future generations to see. And, that is what I came to see! When we arrived, the first place we looked for was a place to park and the best place to do that was at this beautiful Church of St. Martin de Tours. This served a a starting point for our walking tour around town. With only a printed map on hand, we were ready to explore Taal Batangas! Also known as the Taal Basilica, it was named after their patron saint and being the largest Catholic church in Asia, anybody would be amazed by the grand and magnificent structure of this church. Built in 1575, this church has survived eruptions and earthquakes. Efforts have been made to rebuild it and now it stands as a living monument in Taal, Batangas. As we entered, we couldn’t believe what we were seeing. I am not a Catholic, but a structure like this is one of a kind! Now, with the intricate wall paintings found inside the church and the addition of dome ceilings, anyone who enters will be wowed by what they see. As I got closer, I was hypnotized by the shining silver and gold altar of St. Martin De Tours Basilica! Just stunning! Don’t leave the church yet, because there are still so many things to see and one of them is the climb to the BELFRY TOWER. 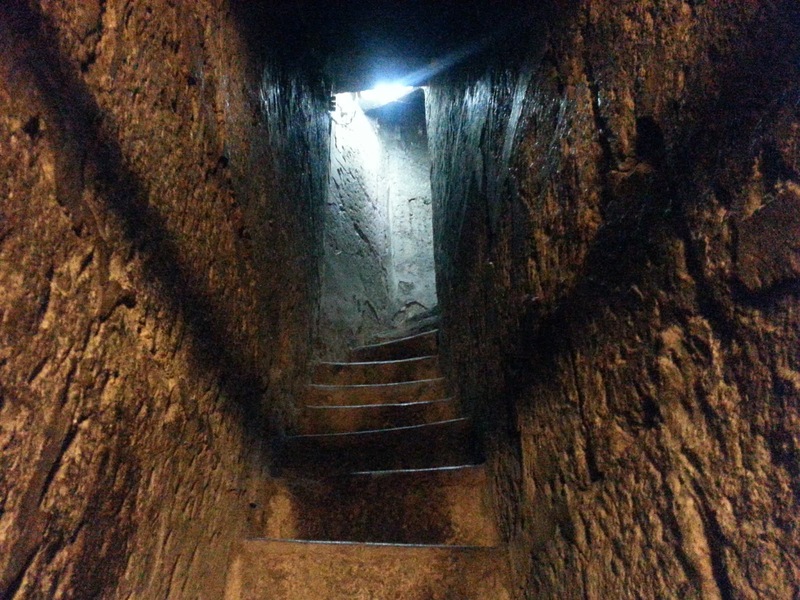 As I walked through this narrow spiral passages as your approach the tower, it reminded me so much of my walk up to the belfry of Yorkminster Cathedral in the UK back in 2012. The walk was pretty safe, and as long as you have no fear of heights, then I guess you are safe to walk around here. When we got to top of the tower, the view of Taal, Batangas was spectacular! A perfect place if you want to see the heritage town from the top! From the top, you could see the Municipal Hall and other colonial houses even from afar. The town of Taal, Batangas is not just known for it’s colonial houses. This is also a place where some of our notable people that shaped our history are also found like Marcela Agoncillo who made the first Philippine flag. St. Martin De Tours Basilica also has a small museum that shows the different artifacts and antiques found in the church. After seeing the Basilica, I was now more eager to see what was still out there in Taal, Batangas. We started our walk from the Basilica and followed CALLE MARCELA MARINO AGONCILLO. It is basically the road next to the municipal hall. It was a great day, it was humid but at least it was overcast just perfect for a walk around town! Everyone who walks around here would have an idea of what life was like before. It was like you are living in the history! Just unbelievable! Renamed after the first saint of the Philippines, SAN LORENZO RUIZ STEPS is a 125 steps that connects the main town to the Casaysay Church and to the WELLS OF ST. LUCIA which I also wanted to see! At the foot of San Lorenzo Ruiz steps, you will find the Wells of St. Lucia, you will find a gold color deep well pump. This is also the entrance to the Well of St. Lucia. I asked some of the locals, about the history of this place. 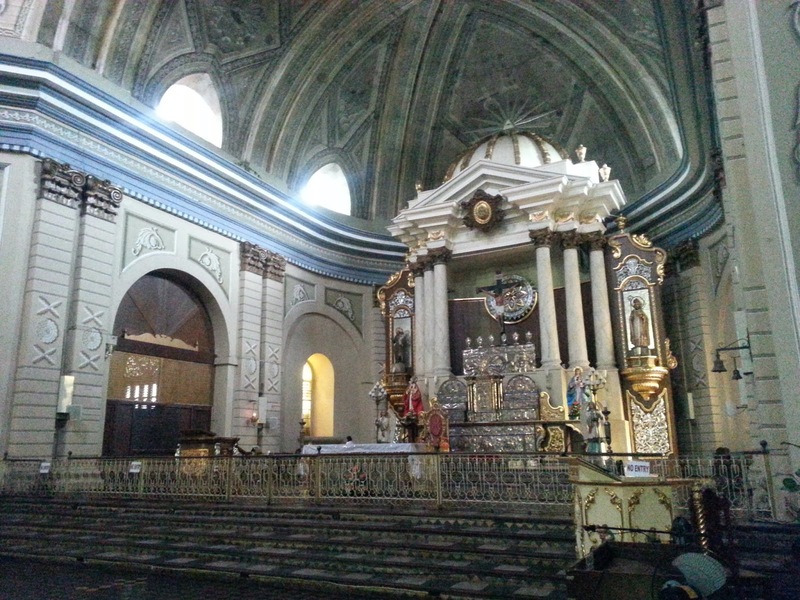 According to them, it was built as a landmark where the image of Lady of Casaysay was found in 1611. The drawings in the ruins was so elaborate and the bush covering it adds more to the mystery of this place. It was also believed that the water coming from this well has healing powers making devotees gather at this place just to get the healing water. The water seems very clean so I decided to give it a try myself. Next to the Wells of St. Lucia, you will find the Church of Casaysay. Not as big as St. Martin De Tours Basilica but in 2012 , Vatican issued that who ever visits or prays here are able to receive plenary indulgence. Another place to visit if you are fond of photography is the GALLERIA HOUSE/ Camera Museum. Here, you will find an enormous collection of cameras never seen before. I asked the guide if they are all functional and they said that all of them are. That’s pretty amazing! They also have a wide collection of pictures that shows the different historical events in Philippines. It was pity that the Marcela Agoncillo who made the first Philippine flag museum was closed. I have to save this for next time! As we were walking back, aside from the well preserved colonial houses, you will also find the not so well preserved houses. I hope the local government and the tourism office could do something about it since I see a lot of potential in the town of Taal, Batangas as the next favorite spot for cultural heritage tourism. A visit to Taal, Batangas was really an overwhelming experience. I never thought I would be able to find a living piece of history not far from Manila. I love this place and I wonder how many of these cultural towns do we still have left? Our last stop was a walk to the public market. Taal, Batangas, is also famous for their craftmanship of Barong Tagalog and gowns at a very affordable price. I will definitely get my own Barong Tagalog here next time! Taal, Batangas is a great discovery! The town itself is a living testament that our country is rich in history and culture. And my mission now is to spread that word that IT’S FUN TO VISIT TAAL, BATANGAS! Approximate travel time from SLEX (Magallanes) 2 hours. 1. From Manila, take the South Luzon Expressway all the way to EXIT 50. Continue driving and enter the Star Tollway. 2. Take the LIPA Exit from Star Tollway. After the exit, turn LEFT at the National Highway towards Taal / Lemery / Cuenca. 3. Drive STRAIGHT for approximately 3.5 km (past landmarks like Fernando Airbase; Petron Gas Station; Sunflower Agro-Industrial Corp.; Vazbuilt Tiles/Vazcom) until you sees a green highway sign on your right side and Phoenix Fuel station on your left side. This green sign will have an arrow directing you to the RIGHT to Cuenca/Alitagtag/Taal. 4. Once you see this signage, make a RIGHT towards Cuenca / Taal / Lemery. 5. Follow this winding road for about 11.5 km. At about 11.5 km you will go past the Alitagtag town’s welcome arch. Continue going straight past this arch for approximately 1.7 km. 6. When you see a Caltex station in Cuenca on the left side, veer RIGHT towards the Alitagtag Poblacion (town proper). 7. Go straight for another 3 km till you see the welcome arch of the town of Sta. Teresita. Go straight for another 3 km till the end of the road, until you reach the National Highway Junction. Your landmark is the Petron Gas Station at the end of this road. Turn RIGHT towards the town of Taal. (This is the scenic route, but not the fastest way). Approximate travel time 2 hours & 45 mins. w/o traffic. 1. Take the SOUTH LUZON EXPRESSWAY and exit at STA.ROSA, LAGUNA. Make a RIGHT after passing through the toll booths towards Tagaytay. Follow this road till the END, where you will pass the Public Market. Make a RIGHT at the dead end, on the NATIONAL HIGHWAY. 2. Take the main Tagaytay National Highway driving pass TAAL VISTA HOTEL, McDonald’s, Josephine’s Restaurant, etc., all the way past the radar; Rodeo Hills Subdivision; etc., going towards Nasugbu. 4. Make an immediate LEFT on the small road after the San Miguel Convention Center, (this small road is before the Petron Station on the left side). 5. Drive PAST landmarks like the Pacific Heights Subdivision; Canyon Woods Subdivision; Fantasy World; Leisure Farms; etc., all the way down to the END till you reach LEMERY. This zigzag road would take approximately 40 minutes drive. Make a LEFT at the end of this road going toward the town proper of LEMERY. 6. Go straight until the dead end and you will see the river and the PANSIPIT BRIDGE, which is the entrance to the Heritage Town of Taal. Make a LEFT turn going uphill toward the town proper of Taal. Sir Angelo… Thanks for this wonderful article about Taal, Batangas… The Basilica of St. Martin de Tours, if I am not mistaken, is a favorite shooting spot for Filipino movies and many tele-novelas; one of which is the wedding scene of Marian Rivera and Dingdong Dantes in Marimar… This pulls me to visit Taal one day… Thanks again. amazing it is and i enjoyed it every bit, this tour is amazing, learn more facts and figures.